Take off your shoes: Feet tend to swell when you fly, so plan to take off your shoes and stretch your toes during a long flight. Do put them back on when visiting the restroom! Get up every hour: and walk the length of the aircraft whenever possible. Or, just get up and move for a few minutes to get your circulation pumping. Stretch: Tense and release muscles starting from your toes and working your way up your body through your legs, rear, torso, arms and neck. Then roll your shoulders, and circle your wrists and ankles. These and simple exercises will get your blood flowing without disrupting your neighbors. Click here for more moves you can do in-flight. Relax: deep breathing exercises or quite meditation will calm your nerves, especially if you’re a nervous flyer. Drink water: every half hour to keep your body hydrated. This also helps you stay active by making you get up to visit the lavatory. Limit caffeine and alcoholic beverages, their dehydrating properties are amplified at high altitudes. 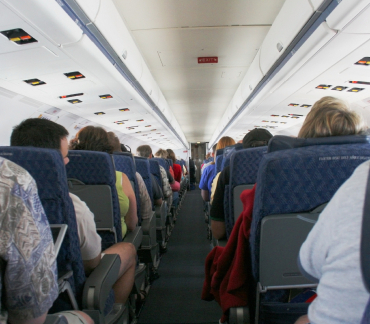 How do you keep yourself comfortable on an airplane?